The STM8-Discovery-Boards come with an integrated ST-Link-Interface, but for any other board you need a special flash tools in order to program the CPU. These litte devices look like a generic USB thumb drive and are sold for well under $3 on aliexpress, just search for st-link. As far as I know there is no solution to use a regular Arduino board as a SWIM-capable flash programmer. The universal programmer uprog2 (website in german only) is based on an ATmega664 and it might be possible to use an Arduino Mega board with this software (untested). 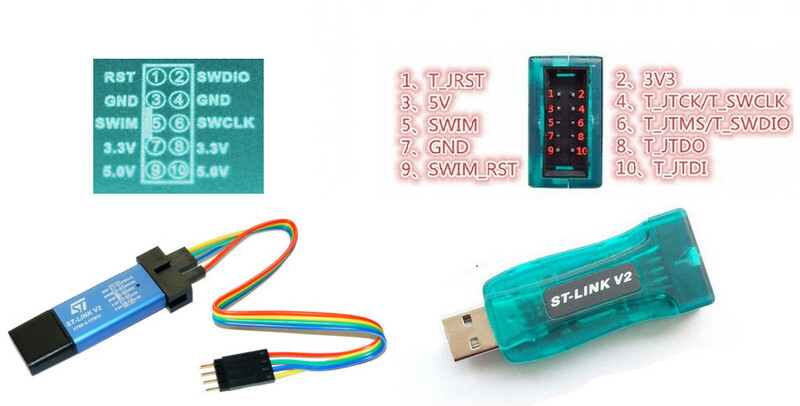 esp-stlink is a ST-Link programmer based on the ESP8266. It allows programming an STM8 via a Wifi connection. The use of this programmer is supported by stm8flash now, but not yet integrated into the Arduino IDE. I didn't test this yet. There are two main versions of the ST-Link V2 compatible flash tool available: One in a USB-Drive-like metal housing (often pink or blue) and one made by Baite in a green plastic housing. Both work well, but they use a different pinout. Both flash tools support the SWIM protocol for STM8 CPUs and the SWD protocol for the STM32 CPUs. The programmer from Baite additionally supports JTAG and is slightly superior to the more common one in the metal housing. Using the STM8S-Discovery board as a flash programmer is a special case and requires some additional blacklisting. I would love to include this driver with the Sduino install package, but I am not sure if this is covered by the ST licence terms for the driver. The Discovery boards made by ST all feature a ST-Link interface as well, but only the Discovery STM8S105 supports the SWIM protocol. The Discovery STM32F0308 implements SWD only and is not usable for the STM8. 1 ? detect oder so?